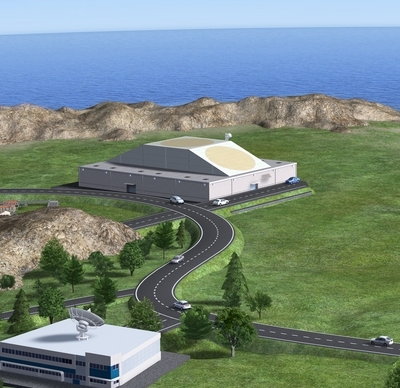 Rendition of ESA’s SSA radar facility (Credits: ESA/P. Carrill). ESA will boost European industrial expertise by developing a new radar as part of the Agency’s Space Situational Awareness programme. The radar will test future debris monitoring techniques, helping European satellite operators avoid space hazards and increase safety in Earth orbit. ESA and France’s ONERA – Office National d’Etudes et Recherches Aérospatiales – research centre have signed a €4 million contract that will see the French organisation and five industrial partners in France, Spain and Switzerland design a test surveillance radar and develop a demonstrator model. Work begins this month. Early debris detection is crucial to help warn satellite operators of collision risks and enable avoidance manoeuvres to be made. The radar will make use of ‘bistatic’ technology, following an earlier, parallel contract between ESA and Spain’s Indra Espacio SA to develop a test radar that uses the ‘monostatic’ approach. Radars work by emitting radio energy at a target, and then detecting the reflected signal. In a monostatic radar, the emitter and the receiver are at the same spot and the energy is emitted in discrete pulses. In a bistatic radar, the emitter and receiver are set up at separate locations and the energy is emitted continuously. For the new test radar, the emitter will be located at a former airport near Crucey-Villages, about 100 km west of Paris, while the receiver will be near Palaiseau, to the south of Paris. The new contract highlights the strong support to European industry provided through ESA’s SSA activities, which began in 2009. To date, over 25 contracts have been issued to industry for SSA-related work, with a total value in excess of €30 million.